On July 15, Turkey commemorated the anniversary of last year’s failed coup attempt with a newly declared “Democracy and National Unity” day. Yet, as many commentators noted, the Turkish government’s public commemorations also laid bare their country’s deepening authoritarianism and national division. President Recep Tayyip Erdogan and his allies have created a historical and political narrative surrounding last summer’s coup that is effective for being both unifying and divisive. Erdogan has used the commemorations to declare a long-awaited victory over Turkey’s secular elite and the Kemalist military establishment that kept them in power. But at the same time, he has also taken the opportunity to co-opt and Islamicize the symbols of Kemalist Turkey in order to consolidate his support among committed nationalists in the military and the population at large. Moving forward, Erdogan’s challenge will be to manage this new narrative — and its contradictions — in order to keep the right people unified and the right people divided. Turkey’s political future will depend on how well he succeeds in doing so. 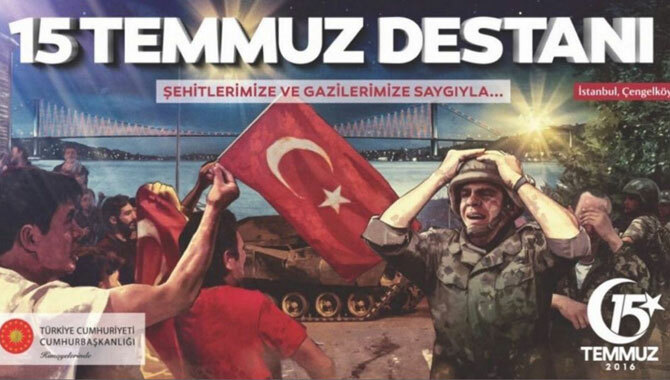 In the days leading up to the July 15 ceremonies, the Turkish government put up large billboards around the country dramatizing heroic scenes of civilians resisting armed putschists. Controversy erupted, though, over one particular billboard that showed a defeated Turkish soldier in tears. Celebrating popular resistance to the coup was fine, nationalist critics said, but there was no need to embarrass or denigrate the military — especially when it was fighting heroically against Kurdish separatists seeking to destroy the country. Quickly, a new billboard appeared featuring a loyal soldier who died resisting the coup. The characters in this movie were intended to represent the terrorists embedded in the ranks of our heroic military. They have no connection whatsoever to the glorious Turkish Armed Forces and its gallant soldiers. Going a step further, government rhetoric has emphasized that July 15 was not even a coup attempt in the traditional sense but in fact a “foreign invasion” orchestrated by Gulen’s puppet masters in Washington. Since Turkey’s Kurdish separatist movement is also widely seen as an instrument of foreign intrigue, this makes both the Army and the citizens who resisted it part of a unified struggle against Turkey’s enemies. What has made the government’s narrative of the coup so effective, though, is its malleability. In solidifying his power since last summer, Erdogan has proved particularly skilled at recalibrating the official account of what happened according to his political needs. Initially, Erdogan embraced the country’s secular opposition, inviting opposition leader Kemal Kilicdaroglu to participate in a giant post-coup unity rally and praising his followers for standing up against the Gulenist coup attempt. Now, however, Kilicdaroglu and his party are increasingly falling afoul of the government’s coup narrative, and joining the ranks of the nation’s enemies. When Kilicdaroglu led a large anti-government protest march, Erdogan first accused him of “marching for terrorists,” then more directly of being a Gulenist agent. While many government columnists still insist that citizens of all backgrounds came out on the streets together to defend Turkish democracy during the coup, others have suggested that members of the secular elite like Kilicdaroglu stayed home, passively watching the events on television if not actively cheering on the military. Running through the government’s rhetoric is the constant offer — sometimes explicit, sometimes more subtle — that as long as the opposition remains sufficiently loyal, it will have a place in Erdogan’s new nationalist consensus. The accompanying threat is that if it becomes too oppositional, its place will be in jail. In setting the coup in historic context, the government’s rhetoric has also drawn on traditional nationalist iconography, but given it a new religious read. While Erdogan is famous for his embrace of Turkey’s Ottoman past, the non-Ottoman nationalist history originally championed by Ataturk has now come to the fore in a new form. The defeat of the coup attempt has been repeatedly compared to Manzakirt, where Seljuk Turks defeated the Byzantine Empire in 1071, and to the battle of Gallipoli, where Ataturk defeated the British during World War I, as well as the Turkish War of Independence immediately afterwards. In the new version, though, these heroic encounters are Muslim victories as well as Turkish ones, and Ataturk is no longer the central hero. “The 15th of July treason,” ran one newspaper column, “was the greatest attack experienced in this era from the crusader mentality that tried to stop us, even tried to destroy us, at Manzakirt and at Gallipoli.” Just as the Seljuks defeated the crusaders and Ataturk defeated European imperialists, Erdogan now claims to be leading his country in another battle against the same sinister forces. Over the coming years, Turkey’s political trajectory and its domestic stability will revolve around the question of who proves sufficiently pious, patriotic, and, most importantly, loyal to remain within the government’s political coalition. Who among the country’s ideologically and politically diverse actors will Erdogan keep within the fold, and who will agree to stay on the terms he offers? What will happen to nationalists cheering on the army’s fight against Kurdish separatists if Erdogan eventually decides to wind down the war? What will happen to members of Turkey’s secular business community, many of whom now appear eager to work with the government, if the economy stumbles or Erdogan moves to expropriate their wealth? To the extent he is able to coerce or cajole the continued support of his current allies, Erdogan may well succeed in consolidating his rule. To the extent the cracks within this coalition prove insurmountable, however, and the government loses control over the contradictions in its new political narrative, things could become much more chaotic. Nick Danforth is a Senior Policy Analyst at the Bipartisan Policy Center. He completed a PhD in Turkish history at Georgetown University and has written widely on Middle Eastern politics.